Wiggles and Imagination Movers are children's musical entertainment groups. The Wiggles were formed in Sydney, Australia. The Wiggles are children's entertainers that have rewritten the way children can be kept amused with song and dance. Sam, Murray, Jeff and Anthony and the characters created by them have now become a part of the lives of so many children. Imagination Movers is a dad's band formed in New Orleans, Louisiana. 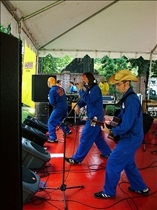 The Imagination Movers started their path as a television/music concept which was aimed to locally in New Orleans. The Movers succeeded in building up a considerable local following by setting educational songs for kids as well as melodies and rhythms which were appreciated by adults also. The Wiggles celebrated their 18th year in 2009, with their own unique catalogue of Hit Entertainment music, television, video and film that are considered to be established as modern classic children's entertainment. The Wiggles are complete performers in their own unique style; they also developed some characters which can support them in entertaining kids. Their signature characters are Dorothy - a green yellow spotted dinosaur who loves to eat roses and also does ballet, Captain Feathersword-a friendly pirate, Wags- a brown furry dog, Henry- singing Octopus which has an underwater band. The Wiggles also have some other supporting characters such as trucks, buses and the big red car and a cast of dancers. The Wiggles have adopted different colored scheme for each character to help children identify each character, Sam wears yellow, Anthony wears blue, Murray wears red and Jeff wears purple. 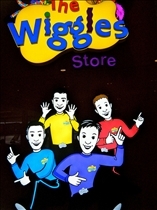 Each of the Wiggles character has character persona; Murray plays a guitar player, Sam sings opera, Anthony likes to eat and Jeff likes to sleep. The Movers started the concept when the four friends began collaborating in a back room after their kids' bedtimes to write songs and develop ideas for a television series. After six years, movers are now a well established kid's band liked by lots of kids and elders. They now developed a fresh sound playing for the annual White House Easter egg roll and conveying a blistering main-stage set at the New Orleans Jazz & Heritage Festival. The Movers are now set to film 25 new shows, planning a 40-city fall tour, and they are ready to release their second CD for Walt Disney Records, "For Those About to Hop". Continuous motion is the way that Imagination Movers like to move. From the start, they haven't shown any signs of slowing down. Building on the success of the band's 2008 Walt Disney Records debut, ‘Juice Box Heroes', ‘For Those About to Hop' features a generous kids' menu of 22 songs. The album consists of all innovative Mover compositions, most of which are fresh tunes written especially for the show. The Wiggles also have had a successful career to date. In 2008, The Wiggles were named as UNICEF Goodwill Ambassadors joining the ranks of Shakira, David Beckham, Nicole Kidman and Roger Federer. The Wiggles have always been great supporters of organizations that help children. As UNICEF ambassadors, they will be focusing on number recognition and literacy as well as sanitary practices. Which kids entertainment group is better? My daughter is a big fan of Wiggles.We really can't compare Wiggles with Imagination Movers, Wiggles are in a different league. of the topic. Youre truly well-informed. I cant believe how much of this I just wasnt aware of.